We believe in meeting people where they're at... and showing them where they can go. 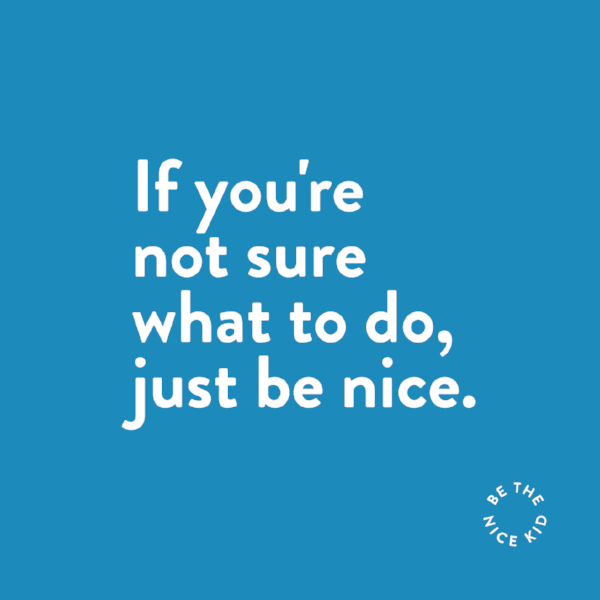 Be the Nice Kid spreads positivity and inspiration to kids, their parents, and their teachers through classroom posters, fun merch, real-life stories, and speaking engagements. We want to be the reminder, the inspiration, the encouragement, the responsibility, and the spark of positivity. Because how you treat people matters. Join the community and see where we can go. 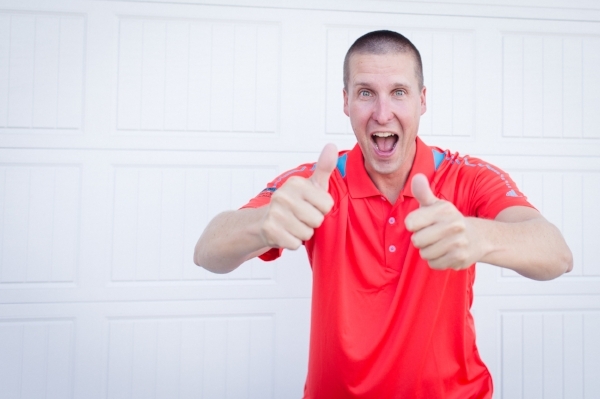 Bryan Skavnak is the founder of Be the Nice Kid and the happiest golf professional in Minnesota. Through his heartfelt and sometimes goofy stories, Bryan blends humor and inspiration to teach you how to Be the Nice Kid. He is the author of the #1 Best Selling book, Happy Golf Starts Here (which is way more about life lessons than golf lessons). As an inspiring speaker and writer, Bryan has helped thousands of kids (and their parents and teachers) achieve their dream of being happier and more confident by revealing how to surround themselves with a team of good people. Bryan has 11 different colored belts, has stacked 5 golf balls on top of each other, and can dance to N ‘SYNC’s Bye, Bye, Bye. He is married to his beautiful wife Kim, and has two darn cute kids, Ethan and Ella, who eat more vegetables than candy. Weird kids. I was a quiet kid. I usually kept to myself. Sure, I had a few friends, but I wasn't the outgoing, talk to everyone type. When my friends weren't around, I'd play Legos and built blanket forts. I'd play basketball by myself in the driveway creating fictional teams with made up players. (Aristotle Jenovosi was 8 feet tall and Mitch Culpit never missed a 3). At school, I tried my best and put in the effort to get good grades (it worked). My parents applauded the effort when I did well and challenged me when they knew I could do better. Sure there were kids smarter than me, but I was fine with that. Because there were also kids who were better at basketball than me. And who dressed better than me. And who had more friends than me. There was always someone better at something than me. I was not Michael Jordan. I was not Michael Jackson. I was not Michael J. Fox. I wasn't even Anthony Michael Hall. (Man, there were a lot of famous Michaels in the late 80s). I was good at being nice. Because I was taught that way. I was taught to respect people and be kind to them. I was taught to use manners. I was taught to smile. I was taught to open doors and lend a hand and stick up for the little guy. Sure I was picked on when I was younger. Because I wasn't cool. Or popular. Or the most out-going. And yes, the saying may be true sometimes... Nice guys finish last. But I was okay with nice guys finishing last. Because I wasn't keeping score anyway. And I thought that way not because I didn't want to win or be good. No. It's because my parents also taught me not to compare myself to others. "Well, what's at the bottom?" "Do I have a parachute?" But mom was right. We don't need to compare ourselves to other people or follow the crowd. Because we have our gift too. Each of us has something we're really good at. I've taught golf to kids for 20 years now. I've been around thousands and thousands of kids. 0 of those kids are on the PGA tour. 0 of those kids are on the LPGA tour. But a whole bunch of them are nice kids. They are kind and respectful and friendly. They work hard. They take care of people around them. They do what's right. (And they stay in contact with me, which is the coolest). Sure, it would be awesome if someone went to play on the PGA Tour. But I teach kindness first. I teach being a nice kid first. Because at the heart of it all, and after your skills and accomplishments and victories fade away... you still have your character.